Harry Lennon's injury-time strike rescued a point for Charlton Athletic at fellow strugglers Bristol City. 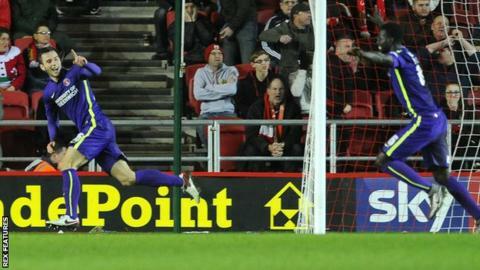 Nathan Baker, on loan from Aston Villa, met Luke Freeman's far-post corner to put City ahead just before half-time. The home side missed a host of chances, with Marlon Pack's penalty, after Jonathan Kodjia was hauled down by Lennon, rattling the crossbar. And they were made to pay for their profligacy in front of goal when Lennon guided the ball in off the post. It was cruel on Steve Cotterill's side, who carved out opportunity after opportunity during a one-sided second half but were unable to put the game to bed. Kodjia was arguably most guilty, twice sending close-range headers off target and then failing to trouble goalkeeper Stephen Henderson when through on goal. At the other end, Tareiq Holmes-Dennis' well-placed curler, palmed away by Frank Fielding, was the only occasion prior to Lennon's last-gasp intervention that Charlton seriously threatened. The result, which means last season's League One champions remain without a Saturday home win since February, slip into the relegation zone - two points above Charlton in 23rd. "Charlton have ended up getting a point they never deserved. "The boys are giving me everything. If we had won four or five nil, which we should have done, people would have gone away saying how well we had played. "We have to make more of our scoring opportunities. I don't blame Marlon Pack because his penalty was two inches from being perfect. "We had so many other chances. Charlton were just trying not to get beaten, which is why they had so many men back getting in the way of our shots." "We come away with a good feeling after scoring so late. I am sure Bristol City will feel they deserved more and I have to agree with that. "As my skipper said to the players after the game, this can be a turning point mentally for the team because we have given away late goals in the past. "I am delighted that Harry Lennon scored because having conceded the penalty it was an extra special feeling for him. He is a young player who gives everything for the shirt." Match ends, Bristol City 1, Charlton Athletic 1. Second Half ends, Bristol City 1, Charlton Athletic 1. Goal! Bristol City 1, Charlton Athletic 1. Harry Lennon (Charlton Athletic) right footed shot from the centre of the box to the top right corner. Attempt blocked. Ademola Lookman (Charlton Athletic) left footed shot from the centre of the box is blocked. Offside, Charlton Athletic. Morgan Fox tries a through ball, but Simon Makienok is caught offside. Corner, Charlton Athletic. Conceded by Nathan Baker. Attempt blocked. Reza Ghoochannejhad (Charlton Athletic) left footed shot from the left side of the box is blocked. Assisted by Simon Makienok with a headed pass. Luke Freeman (Bristol City) is shown the yellow card for a bad foul. El-Hadji Ba (Charlton Athletic) wins a free kick in the defensive half. Attempt missed. Reza Ghoochannejhad (Charlton Athletic) right footed shot from outside the box is close, but misses to the right. Attempt blocked. Luke Freeman (Bristol City) right footed shot from the centre of the box is blocked. Assisted by Jonathan Kodjia. Foul by Tareiq Holmes-Dennis (Charlton Athletic). Elliott Bennett (Bristol City) wins a free kick in the defensive half. Attempt blocked. Joe Bryan (Bristol City) left footed shot from the centre of the box is blocked. Corner, Bristol City. Conceded by Morgan Fox. Delay in match Marlon Pack (Bristol City) because of an injury. Attempt blocked. Luke Freeman (Bristol City) left footed shot from outside the box is blocked. Assisted by Elliott Bennett. Aaron Wilbraham (Bristol City) is shown the yellow card. Attempt saved. Tareiq Holmes-Dennis (Charlton Athletic) right footed shot from the centre of the box is saved in the bottom left corner. Delay in match Nathan Baker (Bristol City) because of an injury. Attempt missed. Elliott Bennett (Bristol City) left footed shot from outside the box is too high. Assisted by Korey Smith.